Currently, no standard method exists to estimate the open porosity (abusevely shorten to porosity) $\phi$ for acoustical materials. Various methods have been developped and are used each with advantages and drawbacks. This page presents some of these methods. This technique was introduced by Leo Beranek in 1942 [Ber42] and was later improved by Champoux, Stinson and Daigle [CSD91] . The principle is to reduce the volume of an enclosure where a material sample is placed. When doing so, the pressure will increase in the enclosure compared to the atmospheric pressure. Of course this increase of pressure depends on the volume of the enclosure and the volume accessible to the air inside the porous medium. By measuring the pressure increase it's possible to determine the open porosity of the material. The larger the samples the more accurate will be the results. This method is close to the one used for geomaterials called gas picnometer (which is detailed in various standards) . The picnometer method is based on the injection of a gas under pressure in the volume enclosure. An alternative method has been proposed by Leclaire and colleagues [LUKM03] . Instead of measuring the pressure increase, one has to equal the volume of the chamber containing the porous sample with the volume of a reference chamber by means of syringes. Scheme of the method introduced by L. Beranek and further modified by Champoux et al. Another method, based on Archimedes’ principle, is to saturate the pores by a gas or a liquid (i.e. a fluid). Knowing the volume of gas required to saturate the porous material we deduce its open porosity. The advantage of the fluid saturation method is its simplicity. Its main drawback is a low accuracy due to the difficulty to saturate the pore network. In addition this technique requires the skeleton of this material to be inert towards the fluid used for saturation. Schemes of the 3 steps to estimate the porosity from Archimedes' principle using water as the saturating fluid. Two examples of publications on Archimedes' principle applied to acoustical porous materials are listed below. Panneton & Gros [PG05] weigh a porous sample before and after removing part of the air contained within the pores by means of an air pump. Salissou & Panneton [SP07] measure four masses at four static pressures to deduce the open porosity and the mass density of a porous material using the perfect gas law. In the equation above, $\omega$ denotes the angular frequency in Hertz. $h$ is the thickness of the tested material sample and $P_0$ is the atmospheric pressure during the test. The uncertainties related to this method are often too high to obtain convenient values for materials with large open porosities. [Sel03] Sellen N., Modification de l'impédance de surface d'un matériau par contrôle actif : application à la caractérisation et à l'optimisation d'un absorbant acoustique, PhD dissertation (in French), Ecole Centrale de Lyon (France), 2003. Fellah et al. [FBLD+03] have developed a method to estimate the surface porosity of a material sample from the measurement, at ultrasound frequencies, of the reflection coefficients for two oblique incidences. This method allows the simultaneous estimation of the high frequency limit of the dynamic tortuosity. The reflected waves are approximated by the waves reflected at the first air-porous interface. In other words, the method gives information on surface parameters. While the surface tortuosity has no physical meaning, it can be noticed that this method could provide the opportunity to measure the surface porosity of a material designed with a skin effect without separating the skin from the core. Indeed, The surface porosity of a material sample can differ from the volumic porosity due to the foaming process or due to the cutting of the sample itself. Umnova et al. [UASC05] have proposed another method at ultrasound frequencies for measuring both the tortuosity and the open porosity of thick samples of rigid porous materials consisting of large grains or fibers with a mean pore size of several millimeters. This method is based on both reflection and transmission measurements. 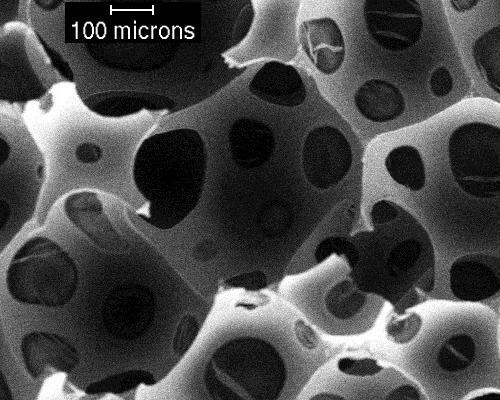 Optical methods have also been developed to estimate the open porosity of porous media. Computed Tomograph Scans (CTS) are usually required to accurately estimate the porosities of acoustical materials in order to estimate a 3-Dimension quantity from 2-Dimension images. Electron microscope picture of a polyurethane foam (Picture credit: Franck Paris, Luc Jaouen). To estimate the porosity of acoustical facings which have a usual thickness of 1 mm or less and can have a porosity lower than 1% a particular method has been developped by Jaouen & Bécot [JB11] . This method relies on the measurement of the acoustical impedance for plane wave and normal incidence of the facing backed by an air gap of known thickness.